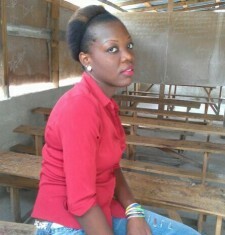 I am Laurette and am studying to be a journalist and now work to visit patients and give them their medications. This is a good initiative that does good work for the country. She took care of someone close to her, now she provides care for others, giving back. Non mwen se Adme Laurette mwen aprann Journaliste,mw ce yon agent de terrain ,map travay nan tikay paske mw trouve al visite malad yo pou ba yo medikaman se yon bon initiative, Ti kay ap fon bon travay nan peyi a.